The timeless elegance of style and service combines with cosseting accommodation, gourmet cuisine, restorative wellness therapies and an unsurpassed location. Choose from one of the 39 exquisite and luxurious rooms and suites, including the ultra-exclusive Eaudesa rooms, almost at sea level. 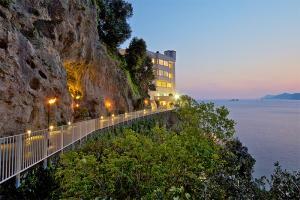 Located in the town of Praiano on the Amalfi Coast, between Amalfi and Positano.